Some of the best (or worst) examples of poor language skills appear when unexpected circumstances arise and a change in policy, service or process needs to be communicated. Yesterday I found two lovely examples at the Wrentham outlet mall (where I also found a cool olive green-zebra print jacket, reduced from a ton to a score). What I love most, though, is that it doesn't explain why there's a problem. "So, is your refrigerator broken?" "Did you run out of yogurt? 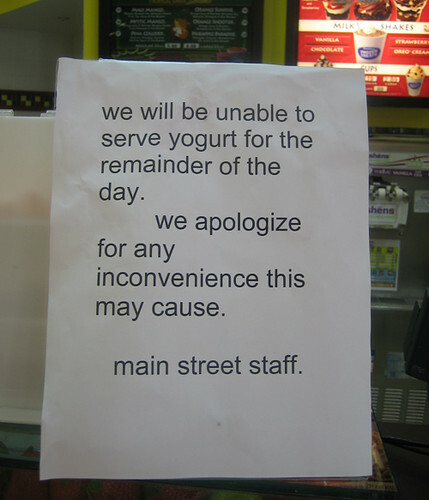 I've been here when the coffee stall ran out of milk, and when the sandwich stall ran out of bread, so I thought maybe ..."
"No, no, we have plenty of yogurt." "So can I have some?" Due to the increase in the economy? 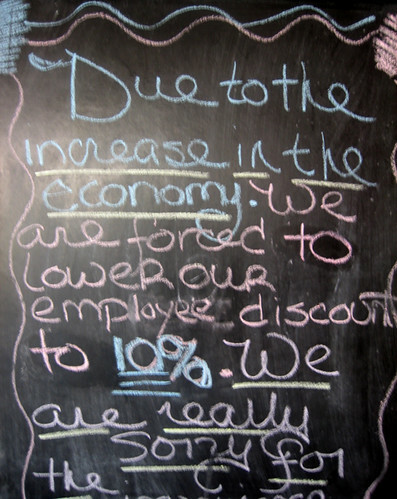 It can't mean "due to economic growth" if they need to reduce the discount. Does it mean "due to the need to be economical"? I asked senior economic correspondent The Boy for his analysis. He had no clue what they were trying to say. I'm not suggesting businesses need to explain their decisions in excruciating detail; merely that if something has changed--and especially when an apology is necessary--it makes for better customer relations, reducing uncertainty and increasing user confidence, when communication is clear. Copyeditor General's ruling: When outlet shopping, it's always a good idea to bring your own snack.